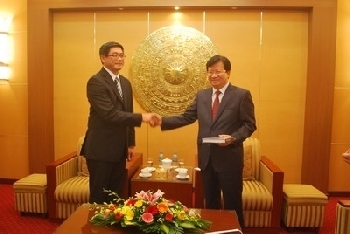 At the meeting, the Minister appreciated the cooperation between Viet Nam-Singapore in the recent periods. According to the Minister, Singapore is one of the leading trade and investment partner in Vietnam with more than 1000 projects (total registered capital of nearly USD 23 billion) in Vietnam, especially the cooperation between the Ministry of Construction of Viet Nam and the Ministry of National Development of Singapore. Minister Trinh Dinh Dung hoped the cooperation between Viet Nam and Singapore in the near future will be increasingly more effective especially in the construction sector, housing development. The new Ambassador of Singapore – Mr. Teck Hean expressed many thanks to the appreciation of the Minister and his pleasure to share experiences and cooperation with Vietnam. The Ambassador said that in recent visit to Singapore of General Secretary Nguyen Phu Trong, the two countries signed a memorandum of agreement on training cooperation and reached the consensus on the policy of bilateral relations. According to the Ambassador, although the real estate market in Vietnam is quiet, but now there are many Singapore business wishes to be invested and confidence in the development of the real estate market in Vietnam. The Ambassador also hoped that the partnership between Singapore and Viet Nam will be more fruitful.